I will be taking a mini hiatus from this blog for the next few months as I settle into my biggest project to date – motherhood. It’s been a long time coming for Mr B and I and we can’t wait to meet the lil’ guy (yes, it’s a boy!). I hope you will bear with me as I make this transition and I promise to return with more things to share on all things design. 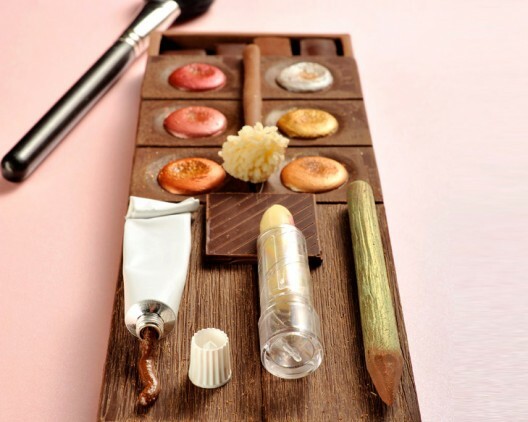 I leave you with this gorgeous make-up palette by Christopher Roussel for Mother’s Day. Opening like a pen, the pencil and brush are made entirely out of chocolate, the lipstick is white chocolate, the cream tube is filled with light chocolate soy milk spread and eye shadows are divided into crunchy praline . The box serves as candy slip of delicate sweets chocolates (ganache, fruit or spices, chocolates, milk chocolate or dark). Beats a regular box of chocolates any day.